It’s amazing what my man won’t do to keep our outdoor critters alive this winter. Mainly because I will not forgive him if anything should happen to our koi. Never mind that an open watering hole is essential to the squirrels, chippies, and myriad birds that visit our back yard. Seriously, they count on us. 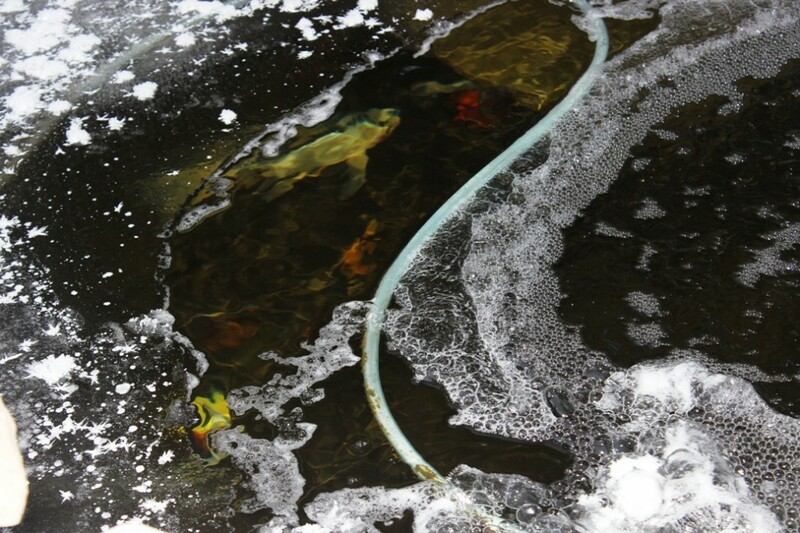 Our koi family spent last winter at the ‘spa’ as we liked to call it. Yep. We captured them and transported them to a facility in Toronto that over winters your fish in warm water so they keep on growing and frolicking and, we thought, living the good life. Hmmmm. Not all was roses, we discovered in the spring. Trying to keep water quality high with huge amounts of koi isn’t easy, and not only did we lose one family member, two others came home that cold spring with open sores from infection. So I immediately and diligently did my homework on how to overwinter my babes in the garage, inside a show tank (that collapses for storage in the summer months). 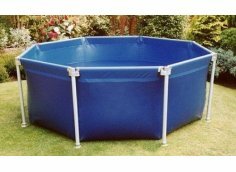 Seemed pretty perfect to me and I almost had him in on this investment…until hubby starts talking to other hobbyists during the 1st Annual Pond & Garden Tour last September. “No worries, leave your koi in your pond over the winter” they encouraged. Our backyard is below an urban forest; deciduous trees, tall red pine, plus mammoth hicks yews. We do not have sunshine beaming its friendly face down on us come spring. 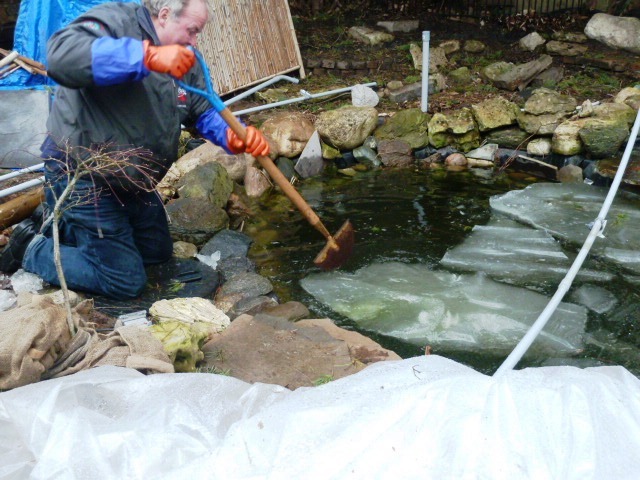 Our entire pond and skimmer were frozen solid at the end of last April, when most other ponds were warming up to about 15C, a goodly temp for re-introducing your koi after a winter of warm water. I was literally at my wit’s end. It was time to bring our fish home from the spa, and there was NO way they could be re-introduced to our pond. After conversations with Clarke Koi, it was determined to break through the ice, drain the pond, and top it up with conditioned tap water, which would at least bring the temperature to 8C. 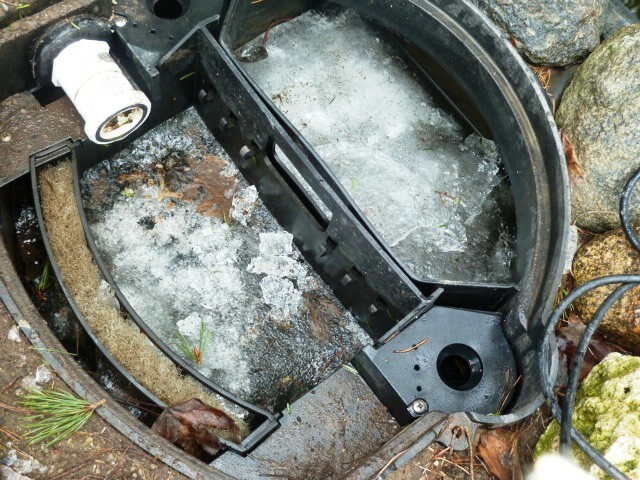 It took 20 kettles of boiling water to make a dent in the frozen solid skimmer (which would afterwards leak all summer, but that’s another story). My man then started calling around for heaters, any kind of heater, to bring the temperature up in time. 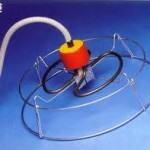 He scored a trough heater from Pioneer Pools, whose service person uses them when needed to repair hot tubs. This lovely man actually lent this heater to us for as long as we needed, as they were not available anywhere else, since it was spring. Who needs a heater in spring? Anyway. You can imagine we didn’t want any repeat performances this winter. No more spa sleep overs. As declared, I wanted them to sleep in the garage with loads of filtration, and believe me it’s still freezing in there. It wouldn’t be a picnic, but they wouldn’t be frozen either. I thought it was a win-win, sincerely I did. When the man became convinced the koi could overwinter in our pond, I washed my hands of the entire plan. All I said was, “If one, just one (and please don’t let it be one of my favourites) of my koi doesn’t make it over the winter, we’re filling this entire pond in, and you can have a pondless waterfall for all I care”. And I meant it. I’d already lived the tragedy of losing one koi family. I would not do it again, for anything. So check this. 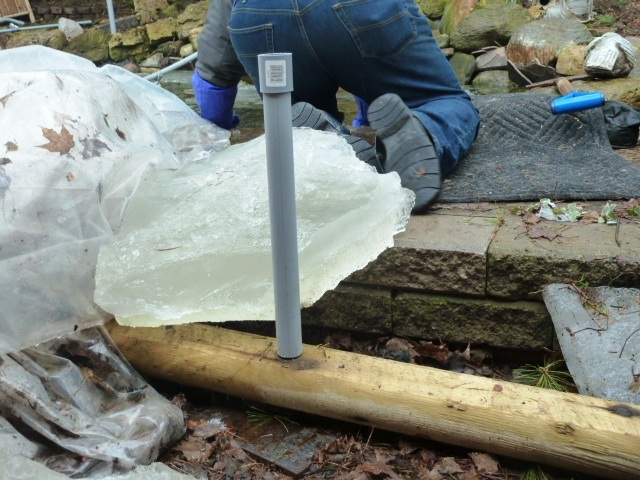 Last fall the man buys a 1000 watt heater for the bottom of the pond and it’s been turned on since late November (he won’t let me see the electrical bills). 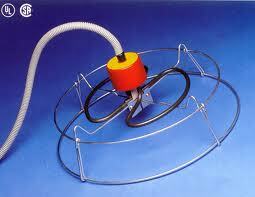 We also have a floating heater to keep a hole open if needed. 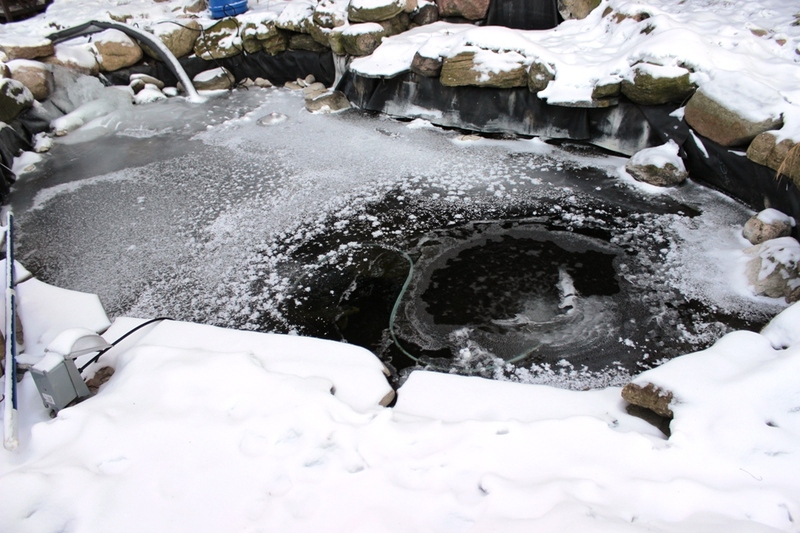 Our trusted koi advisor set up our air stone to bubble near the surface to recirculate the water, oxygenate the beneficial bacteria, and to keep a hole open in the ice. We’re currently in the deepest freeze of January (-20C, wind chill -36C) and it’s the first night that our pond actually froze over. 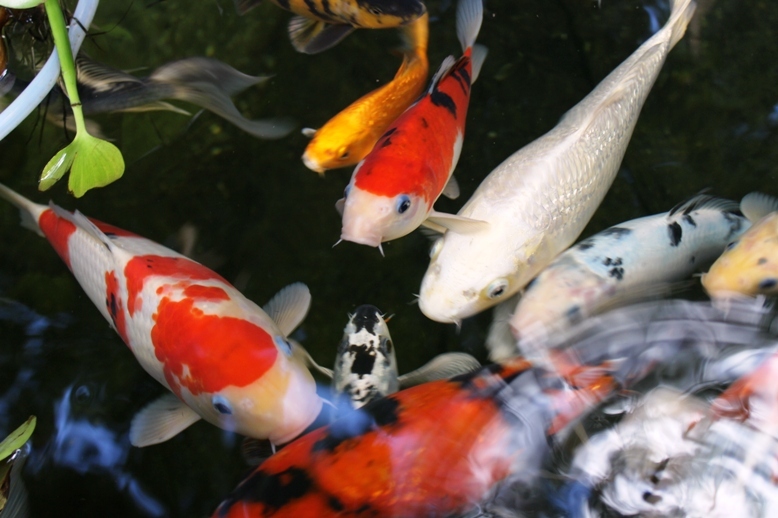 Until today, I’ve spent the winter watching the koi huddle around the water heater like employees around the coffee maker. Fascinating. Temps holding steady at about 8C or 40F. 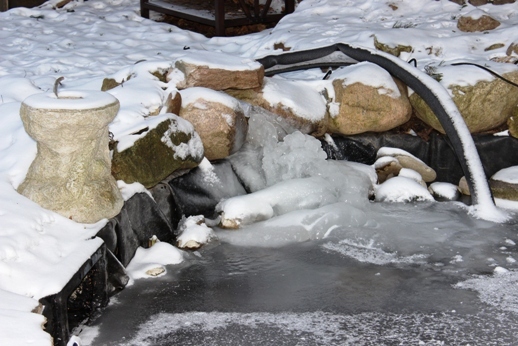 I ventured out this afternoon in spite of the cold to check on the pond, and what to my wondering eyes do I see, but a couple of fish still hangin’ out at the water heater. The rest were huddled together in their underwater house we created for them so they would feel safe.